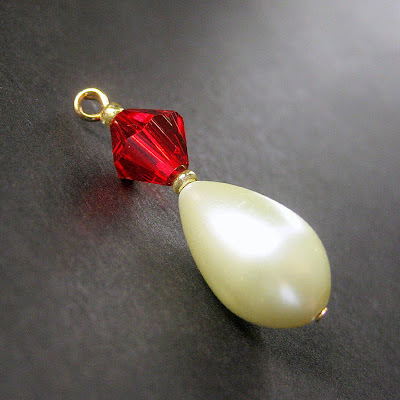 Every once in a while I come across an idea of inspiration that involves a "series" of earrings on a theme. These little green teardrop briolettes were the beads that spurred my inspiration this time and thus, The Elixir series has been born. 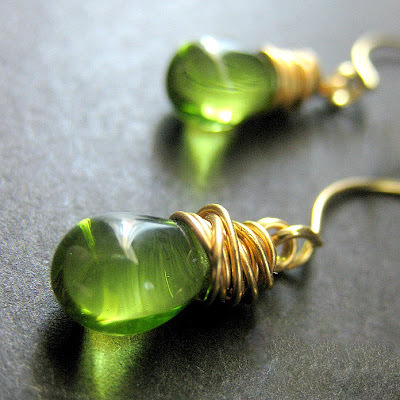 In these Elixir of Absinthe handmade earrings, tiny transparent glass teardrop briolettes in a verdant shade of absinthe green have been carefully and securely wrapped with gold filled wire. The drops are then set to dangle on delicate matching gold-filled hooks designed by hand for a unique and graceful shape. These 1.2-inch (3.3cm) earrings are made with care to be light-weight on pierced ears and easy to wear. An Elixir of Absinthe in Gold is the second in this series. The honey flavored variation is already on display! Over the next month or so, I'll be introducing more and more of these into my collection in different colors and in both gold and silver. Of course, you'll always be able to see the entire collection of what I have available as soon as each new piece is added at any one time. I'll be selling these individually until they're all on display and then be offering the entire set in both gold and silver for those that like a variety of colors as well. When I was little, blue was my favorite color because Cinderella's dress was blue and I was in love with Cinderella's dress. As I grew older, that favorite lingered well into my teens where I decided that I liked green equally to blue and from there, it was a snowball effect really. Once I branched out from blue, there was no holds barred and now, years later, I no longer have a favorite color. Instead, I love nearly all of them! 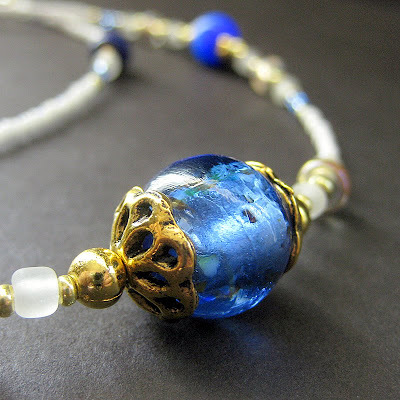 Vibrant and rich, this beaded eyeglass holder is created from blue glass marbles and golden accents combined together in a blend of blue and white that was inspired by Cinderella's beautiful gown. This 31-inch ( 78.75 cm ) strand is made with smooth beads at the nape for the comfort of the wearer and decorative beads at the ends to show off a sense of style while keeping eyeglasses easily in reach. I was inspired by these fantastic glass marbles and as a result, this eyeglass holder is part of the still growing "Losing My Marbles" series!